From the 22nd to 25th of February 2018 the delegates were attending the German Model United Nations in the beautiful city of Weimar. 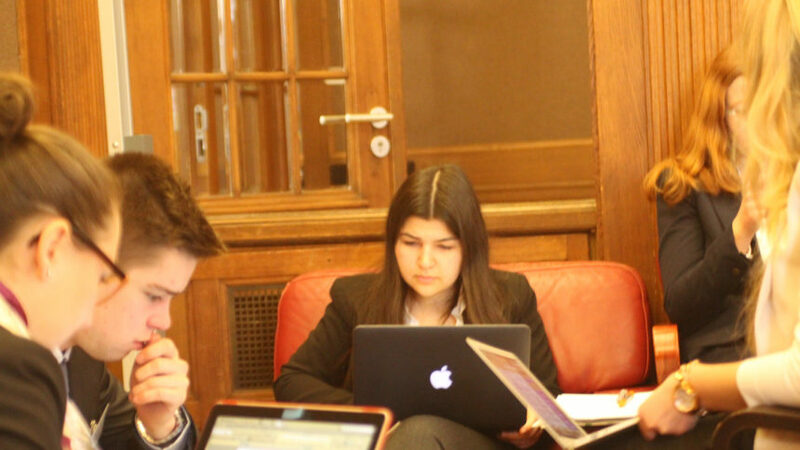 Our delegate Betül Tatoglu was representing Sweden in the Security Council. Here she is writing about her experiences. After the opening ceremony, where we were friendly welcomed, we met the delegates from Erfurt, Magdeburg, Munich and Trier. Then we split up in three committees. I had the honour to represent the Kingdom of Sweden in the Security Council where we decided to discuss the topic “The Situation in Libya”. Due to the fact that we were only thirteen delegates in this committee the atmosphere in our conference room was very tense in the beginning. I was slightly nervous but after the first formal session, the nervousness was gone and I started to relax and to encourage myself to take the chance to hold several speeches during the formal sessions and to actively participate in the informal sessions. One of the benefits of a small committee was that I was able to talk with all delegates and to discuss with them all new suggestions. The more time I spend the more I feel myself confident and I experienced that self-assurance is one of the keywords for being successful. We had a lot of discussions during this four days in the formal sessions but they all were necessary to develop a common ground. Furthermore, I highly appreciated the spirit of cooperation and consensus in my committee because I enjoyed the work so much that I wish we could discuss the two other topics too. We have learned from another and have deepened our skills regarding to holding speeches and acting diplomatically and of course writing resolutions. For me, personally, it was the best learning experience only a few weeks before the conference in New York begins. I think I can speak on the behalf of our delegation that we all are really looking forward representing the Republic of South Africa in the best way.